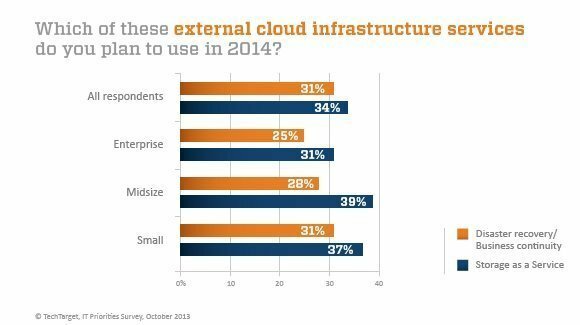 TechTarget's IT Priorities for 2014 survey shows wide interest in cloud services despite recent missteps by some prominent providers. IT shops will devote a significant portion of their resources to storage and storage-related infrastructure projects in 2014, according to TechTarget's IT Priorities for 2014 survey. While storage alone isn't necessarily at the top of IT directors' to-do lists, key initiatives involving cloud services, disaster recovery and data protection are poised to reshape or rebuild the data storage infrastructure in many companies. Last year, 45% of the IT pros who responded to our survey expected their overall IT budgets to increase vs. 15% who were preparing for diminishing budgets. The 2014 picture is even rosier, as 54% expect to have bigger IT budgets, 24% don't foresee any changes and only 11% will have to make do with less. The lingering effects of the Great Recession are still hampering some companies, although we're seeing some improvement. Eleven percent of respondents said they're still mired in recessionary economics (vs. 17% last year), while 42% noted that they're recovering, but slowly (same as last year). Despite all the talk of software-defined storage and software-defined just about everything else, more than half of the respondents (51%) indicated that their companies' IT budgets would include increased spending for hardware. Even more are looking to cloud technologies, with 55% projecting increased cloud spending in 2014. 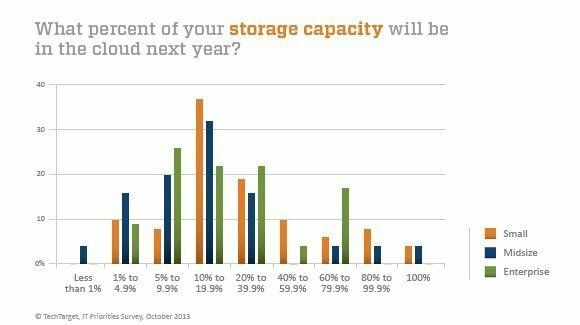 Storage will play a significant part for those companies, as 34% plan to tap into external cloud services to add storage capacity. Interest in Storage as a Service cuts across companies of all sizes, with a slight tilt toward midsize and small firms. Nearly a third (31%) of enterprise firms plan to use cloud storage services for disaster recovery/business continuity (DR/BC); again, midsize and small companies appear to be slightly more aggressive in this area. Twenty-eight percent anticipate placing less than 10% of their company's data in the cloud in 2014, but a healthy 51% said that between 10% and 40% of their data will find its way into a cloud storage service. While more companies launch parts of their IT infrastructure into the cloud, they're still approaching the various services with caution. Although our survey was fielded before Nirvanix and Symantec's Backup Exec.cloud each called it quits, users still had concerns about cloud service providers. Their biggest worry -- across the board regardless of company size -- is whether their company's data will be adequately protected. The second most prevalent concern is the reliability of these services, followed by regulatory compliance. Whether cloud-based or not, projects to improve DR/BC infrastructures are on the docket for 46% of responding companies. Broken down by company size, midsize companies (1,000 to 10,000 employees) top the DR infrastructure list with 56% planning projects; 45% of small firms (fewer than 1,000 employees) and 42% of enterprises (more than 10,000 employees) will be involved with DR in 2014. The more modest numbers at the lower and higher ends of the spectrum suggest that small companies may not have the means to pursue DR projects, while big companies likely have at least some DR infrastructure in place. Looking exclusively at primary storage initiatives, storage virtualization projects (31%) top the list, as they did last year. Storage virtualization has seemingly been on the verge of wider implementation for several years, so maybe as server virtualization matures, more attention is shifting to the storage side of the shop. Cloud storage -- external or internal -- is also high on IT managers' 2014 to-do lists; 30% said it would be a deployment priority in 2014, which is a big jump from last year's 18%. And while some of those projects are likely inspired by spiraling capacity requirements, storage managers are also looking to make better use of their on-premises storage resources, with 24% looking to implement compression, data deduplication or some other data reduction technology. The next four items on the storage project priority list are all closely bunched: storage for big data (19%), solid-state storage (18%), storage for virtual desktops (18%) and scale-out NAS (17%). Company size has a lot to do with how much attention will be focused on each of these technical areas. For instance, enterprise-scale companies are more likely to pursue big data projects (28%), more midsize organizations are preparing to deploy storage for virtual desktops (28%), and solid-state storage is now affordable and ubiquitous enough for companies of all sizes. Backup projects for 2014 are led, as noted earlier, by DR/BC efforts. Not far behind on the priority list is backup for virtual servers (37%). There are far more solid alternatives for backing up virtual machines (VMs) than there were just a few years ago, but VM backup remains a priority at many companies because the virtual server environment -- and all the data it's creating -- is growing at a rate that outpaces backup efforts in some organizations. 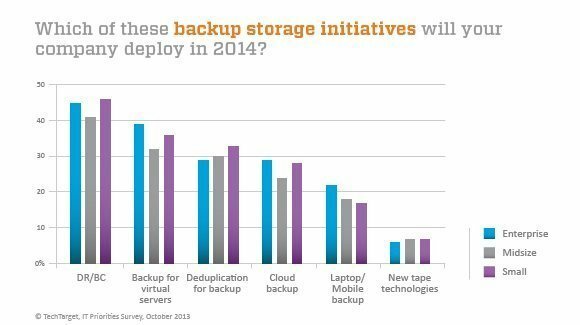 Deploying dedupe for backup operations is on the agenda for 30% of respondents, another indication that although the technology has been available for 10 years, many companies have yet to fit it into their backup environments. Tape continues to fade from the backup scene, with only 7% considering new tape technologies for 2014. But on a more encouraging note, 20% of our respondents said they have plans to implement backup of mobile devices. That's the first time we've asked about mobile backup, and we'll continue to check on its progress throughout the year.